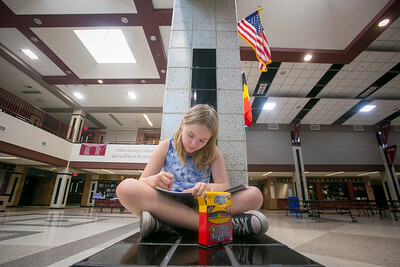 Daryl Quitalig - For Shaw Media Tori Hadlock, 10, sits patiently as she colors a mermaid from a supplied coloring book at Marengo Community High School while she and her father Ross (not pictured) wait for updates about their house located at 8th Ave. and 7th Circle Sunday, June 11, 2017. Early Sunday morning, a 7th Circle home exploded, causing over 50 surrounding homes were damaged from the blast, on of which was the Hadlock's residence. The cause of the explosion is under investigation. 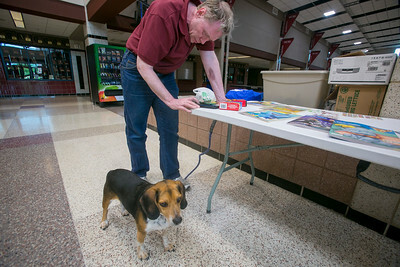 At the high school, other coloring books, toiletry kits, water and food were available to those in need. 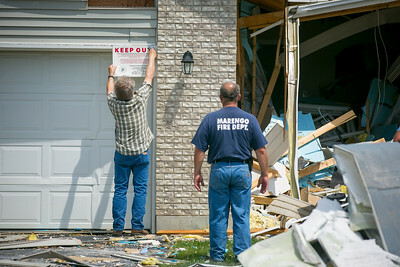 Daryl Quitalig - For Shaw Media Marengo Fire Chief Bob Bradbury watches on as McHenry County Plumbing Inspector Phil Muska hangs up a "Keep Out" sign in the neighborhood of a 7th Circle home explosion Sunday, June 11, 2017. Over 50 surrounding homes were damaged from the blast. The cause of the explosion is under investigation. Daryl Quitalig - For Shaw Media Cpt. 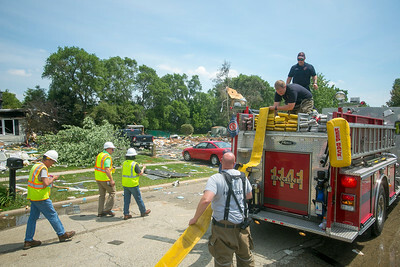 Patrick Fanning (bottom) assists Mike Golden in loading up a hose onto their truck as Nicor employees survey the neighborhood of a 7th Circle home explosion Sunday, June 11, 2017. Over 50 surrounding homes were damaged from the blast. The cause of the explosion is under investigation. 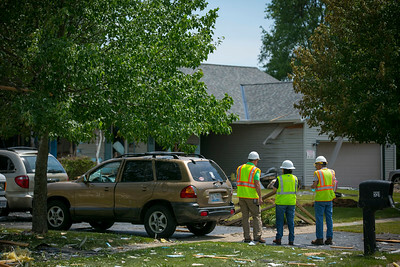 Daryl Quitalig - For Shaw Media Nicor employees survey the neighborhood of a 7th Circle home explosion Sunday, June 11, 2017. Over 50 surrounding homes were damaged from the blast. The cause of the explosion is under investigation. Daryl Quitalig - For Shaw Media Buddy accompanies Ross Hadlock, resident at 8th Ave. and 7th Circle, checks his phone while waiting out updates from the 7th Circle home explosion Sunday, June 11, 2017 at Marengo Community High School. Over 50 surrounding homes were damaged from the blast. The cause of the explosion is under investigation. Daryl Quitalig - For Shaw Media Firefighter/Paramedics Brandon Morrison (from right), Mike Golden, Cpt. Patrick Fanning, and Ben Campbell take a moment after loading up their truck while in front of the location of a 7th Circle home explosion Sunday, June 11, 2017. Over 50 surrounding homes were damaged from the blast. The cause of the explosion is under investigation. Firefighter/Paramedics Brandon Morrison (from right), Mike Golden, Cpt. 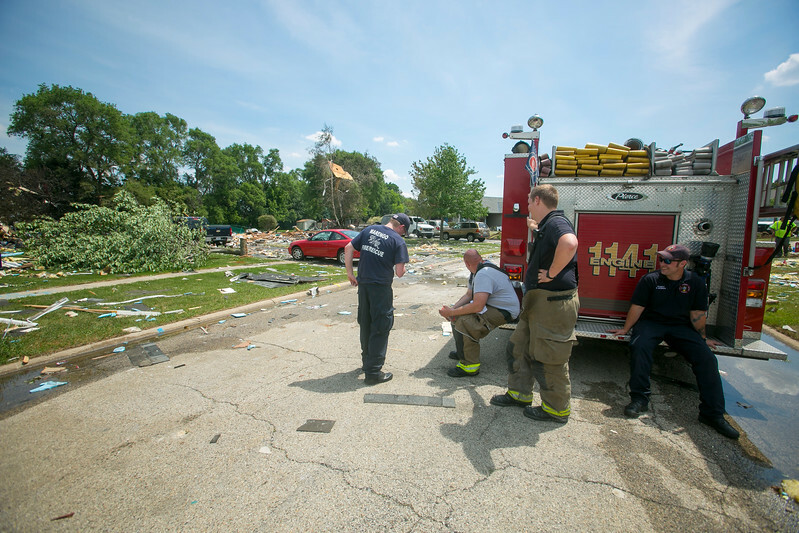 Patrick Fanning, and Ben Campbell take a moment after loading up their truck while in front of the location of a 7th Circle home explosion Sunday, June 11, 2017. Over 50 surrounding homes were damaged from the blast. The cause of the explosion is under investigation.